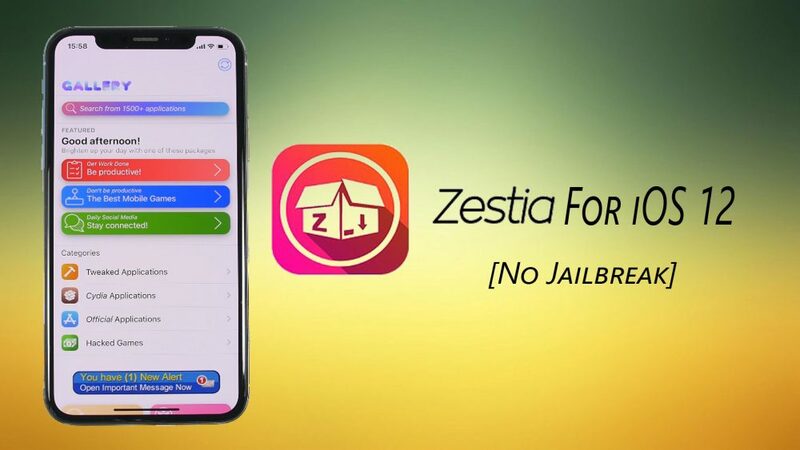 Zestia download for iOS 12 – Hey Guys, today I’m going to show you one of the best Cydia alternatives that you can get for your unjailbroken iOS 12 device. This one is really really awesome and what makes it different from the other ones is that this one will basically find the most updated apps and games that you want to download. So you can get like tweaked games, tweaked apps, jailbreak apps for your unjailbroken device movie apps, music apps all that stuff and they don’t host all of these. Absolutely host just a few of them. but they will find the most updated ones and allow you to download them through their app. So this is what makes it really different and really really great so let’s go further and guys, first of all, I will tell you about the app and then I will show you how to download it on your device. Zestia step is one of the famous Cydia alternatives. it has a bunch of apps and games, tweaked apps, tweaked games that you can download for your unjailbroken device. If you are not getting those applications that you are looking for then you will have a search bar, where you can search for all the apps that are on this app. Of course, you will have different categories in the apps that makes easy to find any particular app. also, I want to tell you guys. For example, if you go to tweaked applications then it will show you the featured one and two and then if you tap to view all then you will see it will compare all their sources and will show you the most updated apps. If you want to install one of them then just tap on it then it will show you a pop-up then tap on the download & install button and then it will show you the tips on how to get it how to trust the app everything. When you tap on the download & install then go to the home screen and you will see right there, the app is downloading and of course, it will be installed in a few seconds. so this is the app Zestia step is really really awesome. you will have different categories, you will have tweaked applications, you will have Cydia applications then you will have official apps that you can download for free and also you will have hacked games. all games are have been hacked with the unlimited number of coins and that stuff. It has a huge number of games that you can download and as I said by comparing all this their sources they will always give you the most updated app. so you will always have the most updated app on your device that’s really great. Now, let me show you guys how you can download Zestia step on your iOS 12 device. to install Zestia step, you just need to click on the link that you will find below. It will take you to the website, from where you can download Zestia on iOS 12. when you are on the website then all you need to do is just tap this button. It will take you the next page. here, tap on the blue button and just click allow then click install and then click next then click install and again click install now you’ve done. Now you will have Zestia step on the home screen of your device. so this is a really an amazing Cydia alternative for unjailbroken devices and all the sources from where you download all tweaked apps and games are within this one app and you can download the latest versions of every app and game. So that’s it for this article guys. thank you guys for reading this article and being with us. hope, this article on ” how to download Zestia for iOS 12 without jailbreak” has worked very well for you. if you like my article then please don’t forget to share it with your friends, family members, and on the social media and also visit daily on this website for reading new & helpful articles like one.